The foreign media and western states are confused and puzzled as to how to interpret the Iranian election on June 12th. Over the past few days I've been speaking with many journalists in Tehran who normally go there for one or two weeks on assignment. Many of them, initially, believed that Ahmadinejad's declared re-election was similar in nature to his first term election in 2005. Meaning that he had successfully mobilized his base of poor people and conservatives and that the reformists and Iranian middle class had, once again, lost the election. But recent development tells us that this is not the real story. Was the Iranian election rigged? No doubt it was. There are many signs that indicate a very organized fraud, which has been in the works for many months. It's inconceivable that Ahmadinejad could have won 24 millions votes. How could he when he had only received just over 5 million in the first round of the 2005 election? In the second round he gained 16 million and that was simply because he was running against Ayatollah Hashemi Rafsanjani, who was very unpopular at the time, a man that was rumored to have corruption in his family, rumors that became etched in the memory of the Iranian people. There was even a saying that "anybody could beat Hashemi in the second round". At that time, even Ahmadineajds's second position in the first round was so controversial that he was accused of an organized fraud led by Iran's militia forces, Basijis, and the Revolutionary Guard. Now, without any change in Iran's demography, he received, in some places, figures of twenty times more votes than he did four years ago. During the past four years, Ahmadinejad's economic policies have increased inflation from approximately 11 percent to 25 percent, more than double. The effects of such policies have been a hard reality for millions of Iranians. He is the only president in Iran who has not gained the support of Iran's middle class and elite. Although his government spent billions of dollars on propaganda, he remained widely criticized by reformists, experts, civil society activists and even some conservatives. On the other hand, Mousavi (Iran's prime minister at the time of war with Iraq 1980-1988) is very well respected and popular in the society. Iranian people know him as a man of integrity, a politician who managed the war economy quite thoughtfully. The overwhelming support for Mousavi by the Iranian middle class, the political elite, reformists and millions of people was contagious even amongst part of the conservative base (also known as Ahmadinejad's base). Mousavi drew crowds of more than 50,000 to his rallies over the past three months in small and large cities alike, not just in Tehran. So a landslide victory seemed like a joke. When did the suspicion start? On election night, Mousavi received a call from the Ministry of Interior telling him of his victory. Meanwhile, a committee, which included the Minister of Interior himself and two of his deputies, announced different results. They declared Ahmadinejad as Iran's President elect faster than anyone could imagine. While the election was still in progress a news agency, known to strongly support Ahmadineajd, had already written about his landslide victory. It was as if they knew in advance. In less than a few hours the authorities began announcing the results by the millions. Everybody who is familiar with Iran's bureaucracy knows that it's just impossible to have possibly counted the ballots this fast. The voting process is not computerized but totaled by hand and therefore it takes quite a bit of time, particularly with voter turnout being at a record high. So it was obvious that the results were not based on actual votes. Also, like many countries including the United States, Iran is a very diverse country. Candidates naturally have more support in some provinces than in others, like their hometown for example. It's impossible that a candidate could win by a same margin in every single province as Ahmadinejad, allegedly, has. This is numerically improbable and does not make sense to anybody. The results of this election make a mockery of the Iranian voting system and their history as a democracy. 1. Before the elections, Ahmadinejad's supporters, major news agencies and radical newspapers, predicted a landslide victory. They even mentioned a plausible win by 60 percent! An alarming and odd a prediction in a country where one cannot even predict the price of a tomato, or an onion, from one day to the next. 2. The results were announced too quickly to be true. It was as if they already knew what the numbers were going to be. So it seems that the authorities didn't even have to bother to actually count the ballots for results. 3. On Election Day, the police were ready for the huge presence of protesters in the major cities. They were fully armed and well equipped with anti-riot gear. What was supposed to happen? Why were they so prepared? 4. A few hours after the results were announced, and even with all of the complaints, the Iranian Supreme Leader announced Ahmadinejad as the next president, and asked all of the other candidates to cooperate with the winner. Why such a rush? 5. Dozens of prominent reformist politicians and journalists were systematically arrested within 48 hours of the announcement of the presidency. Forces were organized, knowing who to arrest and where to go without legitimate reason. But this game could not afford prominent political figures to potentially play leadership roles against the outcome. 6. On Election Day SMS services were cut off followed by cell phone reception the day after. Reformists websites were blocked as well, which forced a disconnect between surprised reformists and their supporters. Everything happened very quickly. It's been part of the plan to be swift. 7. A top-down pressure began. 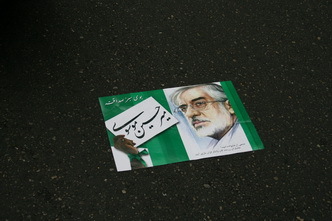 Mousavi and Karrubi were placed immediately under unofficial house arrest. There were told that it was for their own security. Simultaneously, some of the major religious figures from the office of the Supreme leader, and reportedly, some of the other officials in power pressured Mousavi to accept the results. 8. The next day Ahmadinejad's supporters, many of whom were armed with cold arms, rallied in one of the squares in Tehran in a show of power. 9. At the same time, the spontaneous, and unexpected massive protests began. (Which was not expected on such a scale (because Iranians know how the police and the government can go wild and brutal). Ahmadinejad called it a rebellion. It was a necessary label for justifying the police action taken to stop the protesters. The protests were peaceful, but the police themselves, started to destroy cars setting the scene for confrontation. 10. Now, you put together the above pieces and tell me what you would call it. Is the media covering this election properly? There are some good reports. But consider that many of the journalists are not able to report freely. They know that the government monitors their work closely. They can easily be forced to leave the country. The news agencies, which have correspondents in Tehran, do not want to jeopardize their visa situation nor their ability to have their people on the ground. Even CNN's Christiane Amanpour grossly underreported on the number of Mousavi supporters in Monday's protest in Tehran. She described "thousands" when in fact, it was apparent that there were "hundreds of thousands". It is no surprise. I personally know many journalists who have never been able to renew their visas after writing blunt pieces about the realities on the ground. For many of them it is a matter of professional survival. Beyond this, many of them are not able to connect the dots. They cannot travel throughout the country, many of them do not speak Farsi and there are there just there for a few weeks and like many are just as surprised. Also, some of the commentators on cable TV tend to add the United States to the equation unnecessarily. This is wrong. What is happening in Iran has nothing to do with the United States. Iranians have been fighting for their rights for decades now. However, if the U.S. had an open and amicable relationship with Iran, it would be more likely that the Iranian authorities would have to behave and respect the demands of the people. The best way to follow the development of the events as they unfold is to follow multiple and diverse news channels. What should the United States do? President Obama is in a very critical situation. No matter what happens in the coming days, Obama should not congratulate Ahmadinejad for his victory. He did not win the election, he stole it. However he should stick to his plans to negotiate and communicate with the Iranian government. Most of the U.S. allies in the Middle East, from Egypt to Saudi Arabia, have a much worst political situation on their hands and yet they remain friendly with Washington. If the Iranian government engages with the U.S. in the coming months and years under Ahmadinejad's second term, it will surely be harder for the Iranian government to ignore their responsibility to the Iranian people. Iran's disconnect from the outside world has served the radicals in Tehran more than anybody else. Also, the United States should not take side. If Obama supports the protesters it gives the Iranian authorities the reasons they want and need to portray the recent protest as an American phenomena. Play into made up stories of how, for instance, CIA and Moosad and the other intelligence services on the planet are behind the scenes of such an original and genuine movement. The United States and other western countries should put more pressure on the United Nations to act more decisively. So far more than 10 people have died. (I just received word from a reliable source that 9 people died in Rasool e Akram Hospital in Tehran, and a tenth one had been shot and killed earlier). The United Nation's Security Council really should hold an emergency meeting over this issue. The protests have potentials to be another Tiananmen Square, particularly when the police and the militia are interested in turning these peaceful protests to chaos. This gives them an excuse to use force, something they are waiting to do it. The UNSC should adopt a resolution in condemnation of the use of force against peaceful protests. This post will be updated with more questions.